Now sweet potatoes show up on our table regularly, from my favorite 20-minute meal (this is a must-try, my friends!) to a hearty vegetarian curry. When I first got a spiralizer attachment (affiliate link) for my KitchenAid mixer, I practically wore the thing out by making batch after batch of my mother-in-law’s slow cooker applesauce. We finally hit our fill and I moved onto spiralized sweet potatoes and zucchini. Both are fantastic substitutes for pasta or rice when you’re cutting carbs, but they also make easy side dishes when combined with sauteed with herbs, garlic and other mix-ins. 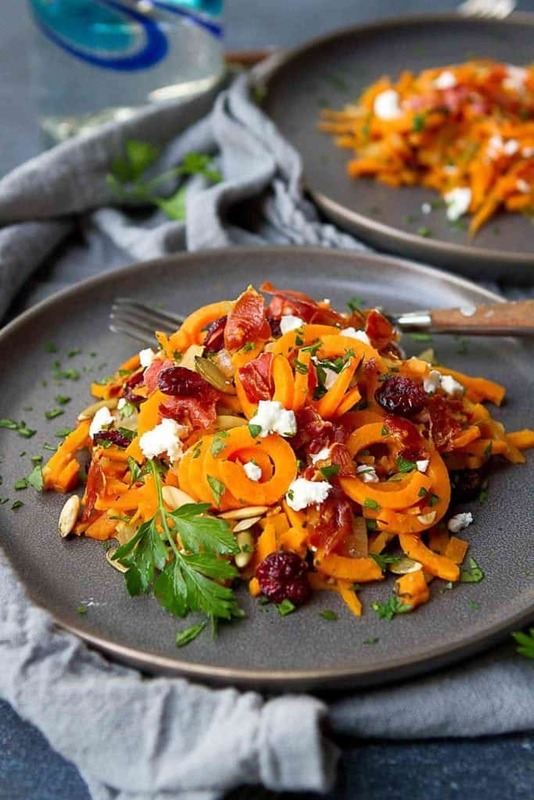 In this recipe for sweet potato noodles, I used some of my favorite fall ingredients, such as pepitas (pumpkin seeds) and dried cranberries. Mixed with salty baked prosciutto and creamy goat cheese, they make a delicious side dish that is good enough to grace your holiday table, but easy enough to serve with a weeknight meal. Start by baking the prosciutto, one of my new discoveries in the kitchen! 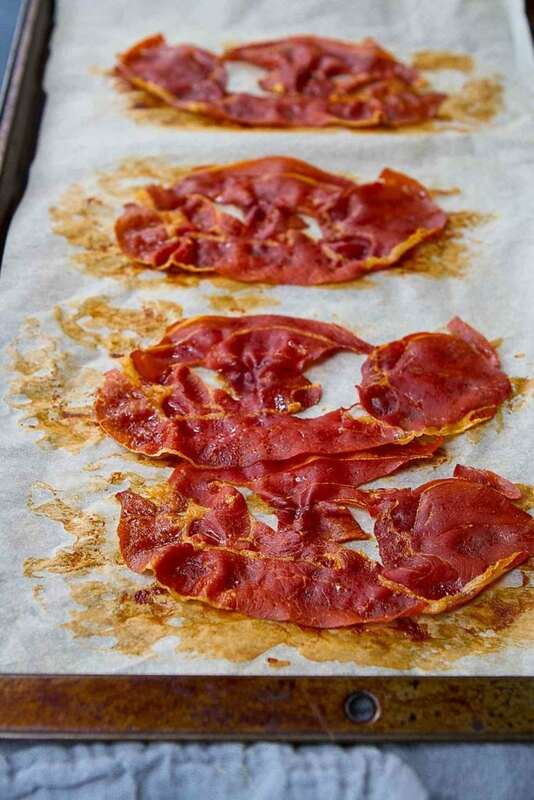 Line a baking sheet with parchment paper and lay the prosciutto out in a single layer. Extra slices keep well in the fridge, in a resealable plastic bag, so make extras for crumbling on salads or pizzas. In this recipe, I used the thicker sweet potato noodle blade on the spiralizer. If you choose to use skinnier noodles, the cooking time will be less and you won’t need as much vegetable broth (1/4 cup should do the trick). To toast the raw pepitas, place them in a small skillet set over medium heat. Cook, stirring occasionally, until starting to brown. Watch them carefully so they don’t burn! 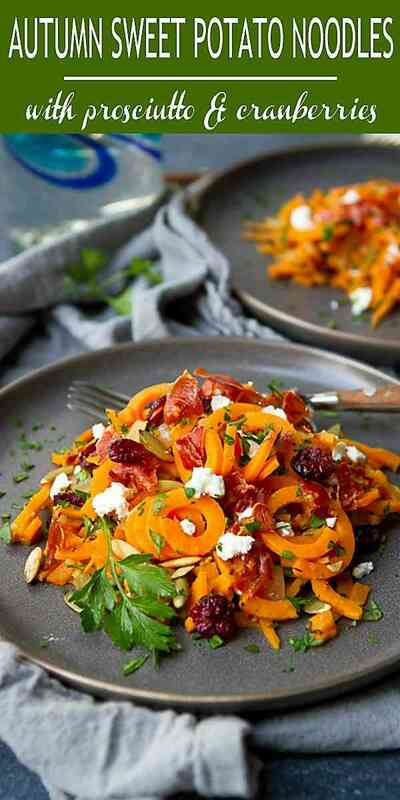 Once the sweet potato noodles are tender, remove from the heat and stir in the toasted pepitas, goat cheese and parsley. Sprinkle the baked prosciutto over top so it doesn’t become soggy. Trim the ends from the sweet potatoes. 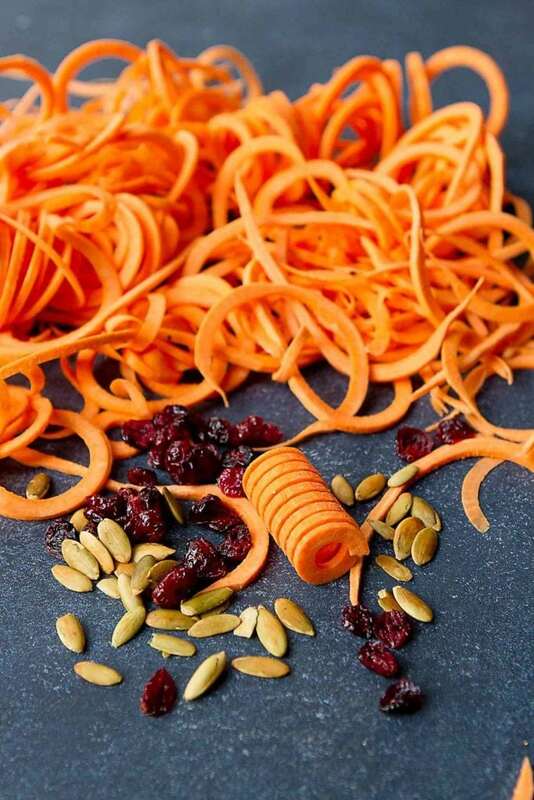 Run through a spiralizer to form sweet potato noodles. Depending on the size of the sweet potatoes, you may need to cut in half crosswise to fit them in the spiralizer. Heat the olive oil in a large nonstick skillet set over medium heat. Add the onions and cook until tender, about 5 minutes. Stir in the garlic, thyme and salt. Cook, stirring, stirring for 1 minute. Add the sweet potato noodles and vegetable broth. Cover and cook until the sweet potatoes are tender, about 10 minutes (see note), stirring occasionally. Remove from the heat. 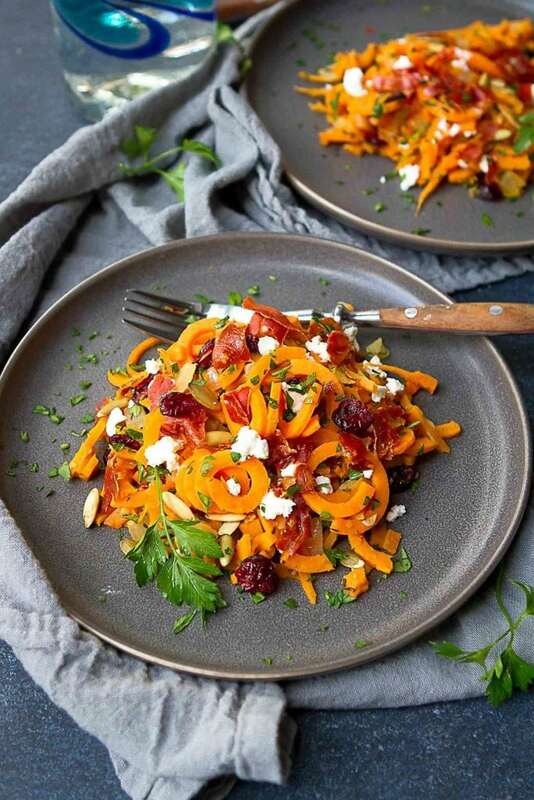 Stir in the pepitas, dried cranberries, goat cheese and parsley. Top with baked prosciutto. Serve. Note: In this recipe, I used the thicker sweet potato noodle blade on the spiralizer. If you choose to use skinnier noodles, the cooking time will be less and you won't need as much vegetable broth (1/4 cup should do the trick).